“Global market volatility,” the “debt crisis in Greece,” “China’s equity market plunge” and the chaotic “efforts to stabilize” it, “declining commodity prices,” “fresh shocks from Puerto Rico,” topped off with “an extended outage on Wednesday for the NYSE.” This is how LCD HY Weekly by S&P Capital IQ described the atmospherics of the US bond markets during the week. It was when the booming if somewhat dented US bond markets took a broadside: Issuance of investment-grade bonds had seized up for the seven trading days in a row prior to Tuesday! In the junk-bond market, no new issuance made it to market at all this week, the first non-holiday week with zero issuance since July 2013, the peak of the Taper Tantrum. And in the prior week, only two deals for a measly total of $1 billion were priced. For all practical purposes, the primary junk-bond market has seized up. Companies could have sold bonds. But in the chaos surrounding the markets, they would have had to offer a higher yield than anticipated, and deals were put on hold, pending better times. And now this debacle: a week during which no junk bonds came to market. During the same week last year, eight junk-rated issuers sold in total $6.78 billion in bonds. Year-to-date, $185.7 billion in junk bonds have been issued, down 2.5% from the same period last year, the first time since early February that sales have dropped below last year’s pace. “Things are on hold. Higher quality stuff can get done at a price, but no one wants to do that,” a head high-yield banker told LCD. On the investment-grade side, the door cracked open on Tuesday, after a no-deal period of seven trading days, with $30 billion in bonds issued since then, including Charter Communications’ senior secured six-tranche offering for part of its Time Warner and BrightHouse acquisition. But Charter’s junk-rated portion of about $3.5 billion got hung up. It might hit the market next week, “depending on conditions.” But “one source” said that there was no urgency and that it could be brought to market as late as September. There were “mixed signs,” and “many widely held par names felt pressure and traded lower in spots,” LCD said. But Thursday, the mood changed. Stocks in China soared. Then they jumped in Europe, and finally in the US though they later lost most of their steam, and commodities bounced off, and the feeling spread that the world wouldn’t for now fall off a cliff. It encouraged a “modest bounce” in “recently damaged” junk bonds, especially commodities bonds, even as Treasuries sold off sharply. It has been the most phenomenal bond boom in history: $891.4 billion in bonds were issued at historically low yields during the first half, up 7.5% from the same period in 2014, itself a record year, according to the Securities Industry and Financial Markets Association (SIFMA). But nearly all of the growth this year was in investment grade bonds. 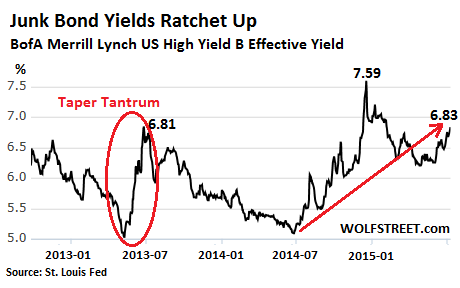 Junk bonds have had a much harder time this year as investors are beginning to grapple with a sense of reality, and in this reality they’re suddenly seeing has some ugly nuances. But these numbers don’t include the debacle of July, when the primary bond markets seized up, and where uncertainty now reigns. And over-leveraged, junk-rated Corporate America is going to have a harder and more expensive time playing its games with borrowed money. Investors beware! One of the companies whose junk bonds got hammered this week isn’t even in commodities or energy, but in the semiconductor sector: Advanced Micro Devices. Late Monday it said that its revenues would drop sequentially 8% in Q2, instead of 3%. It blamed lousy demand for consumer PCs. Its shares have since plunged 20%. And its 7.75% notes due 2020 have dropped over 7% from 86 cents on the dollar to as low as 79.5 cents on the dollar. Investors are smelling a rat.